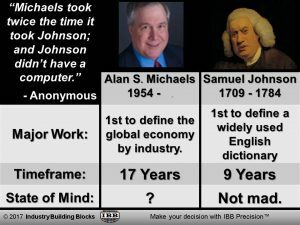 In his quest to continuously improve what is already the best model of the global economy by industry, Michaels is passionate, focused and driven – and he believes Johnson should have spent one more day to discover a word that combines the meaning of all three terms. Because IBB is positioned as a pure Research company – and not as a business consulting firm – IBB has been able to leverage its relationships with its business channels, vendors and customers to enhance IBB’s management decision making, especially when it comes to new use cases for IBB’s strategically relevant information. Hence, we encourage firms of all types, including the top 10 global consulting firms, to leverage IBB data as an IBB Channel so that you and your customers can help shape IBB’s future.